Franklin D. Roosevelt scuttles his way to the Capitol Building to address the attack on Pearl Harbor on December 8, 1941. 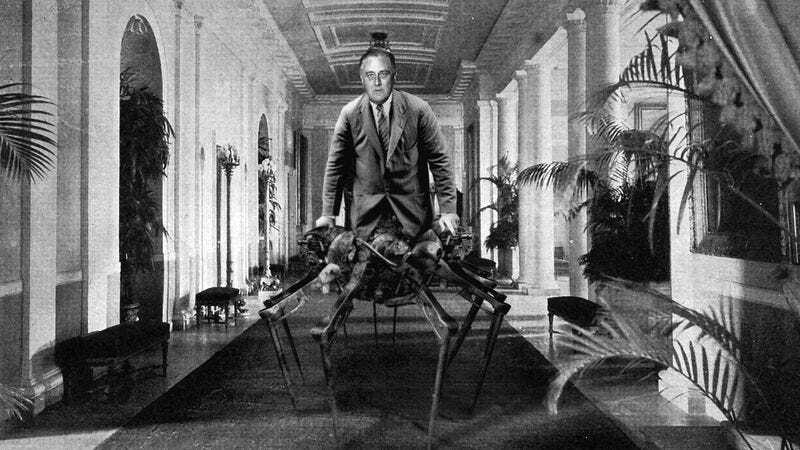 NEW HAVEN, CT—Shedding new light on one of the most influential leaders in American history, Yale University historians released a report Thursday that suggests White House officials deliberately hid President Franklin Roosevelt’s mechanical spider legs from the public. The report, which draws upon a recently discovered trove of photographs, state documents, and personal journals, describes a coordinated effort by top aides to conceal the fact that the 32nd president relied on a set of eight hydraulically powered cast-iron legs to skitter about during the last two decades of his life. “Records show that even some members of his Cabinet were unaware Roosevelt was a robotic arachnid below the waist,” Elmore added. According to historians, the president’s entourage blocked views of his wide base of spindly metal legs by closely flanking him on all sides until he was safely behind a desk, a table, or one of his specially crafted 6-foot-wide podiums. If he needed to be seen seated, they reportedly covered his legs with blankets or pillows, as was the case at the 1945 Yalta Conference, when assistants draped 11 wool shawls over his lap before he posed with Winston Churchill and Joseph Stalin. The president is said to have cherished getaways to his personal estate in Hyde Park, where he was free to scutter around the grounds without fear of being spotted. Various written accounts reveal that when driving him to public events, Roosevelt’s chauffeurs always parked his Lincoln convertible in hidden garages so no one could glimpse him exiting the vehicle, a noisy process that required him to extend his long, clanking alloyed limbs out the limousine’s door one at a time until he could crawl out onto the pavement. While most reporters kept the president’s condition off the record, Secret Service documents show that agents often confiscated the film of noncompliant photographers. Historians discovered one set of images in which Roosevelt, his hands occupied with the adjustment of his bow tie, can be seen standing on his two hindmost legs and using each of his remaining legs to sign six different executive orders simultaneously. “We also believe the mysterious rhythmic banging heard during his ‘Infamy’ speech is the sound of at least three of his heavy iron feet tapping nervously on the floor,” he added. Unearthed blueprints indicate many renovations were made to the White House during FDR’s administration, including widened doorways and a titanium-reinforced bed frame to support the extra 400 pounds of his specialized extremities. In addition, financial records confirm Roosevelt retained a full-time staff of machinists and metalworkers to handle repairs and keep him moving around during his more than 12 years in office. Because the concealment of his condition took an enormous emotional toll, the president is said to have cherished getaways to his personal estate in Hyde Park, where he was free to scutter around the grounds without fear of being spotted. It was there, records suggest, that he sought refuge during the most trying days of the Great Depression, clambering up the wall to a ceiling corner of his study to devise his outlines for projects such as the Civilian Conservation Corps and Tennessee Valley Authority.